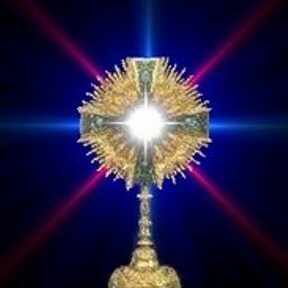 Eucharistic Adoration is simply our response to Jesus' love for us. 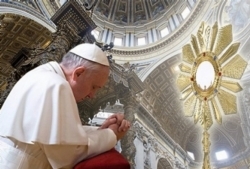 We invite everyone to spend at least one hour a week with Jesus in God's Eucharistic Presence. Everyone is welcome to come to the Chapel (located on the southeast side of the vestibule). Be in the presence of Jesus, pray for your special intentions or sit quietly and be renewed. Does your schedule permit you to volunteer for a special time weekly? You are needed to fill the hours when there is no one praying in the chapel. The Chapel will be closed while the liturgy is taking place for the regular Sunday Masses. I believe that You are really here in this Sacrament. Night and day You remain here compassionate and loving. You call, You wait for, You welcome everyone who comes to visit You. in order to remain with us until the end of the world. which Your Angels delight to behold, so that I might have courage to approach the throne of Your mercy. to merit for me the fullness of heavenly favors. Awaken in me such confidence in You that their fullness may descend ever more fruitfully upon my soul. spiritual and temporal which He has bestowed on me. Grant me grace and perseverance in your faithful service.